Is getting money your primary motivation? Do you just want your things to go to a good home and become useful again? Do you want your excess possessions to support the work of non-profits? Are you concerned about the environmental impact of discarding so much stuff? It is hard to do anything if you don’t have a plan. If you have already found a new place, you will need to evaluate all of your current belongings for their suitability and practicality. Measuring rooms and furniture is mandatory. If you haven’t decided where you are going, you still need to examine what activities need to continue in a new environment, and which belong to a past life. Then figure out which possessions are associated with those interests, work and pastimes, and downsize accordingly. TV shows that demonstrate how to de-clutter have motivated thousands to confront their demons around stuff. However, sometimes they give the impression that results are instantaneous. People, who have lived in places for a long time, generally have more work to do. We recommend beginning 6 months to a year in advance of a proposed move to sorting and purging. You don’t want to get into a time crunch that forces you into making bad decisions, or worse, taking things with you that won’t fit with the new décor or lifestyle. Some of the most cluttered areas in homes are rooms that are being used for storage, like spare rooms, basements and garages. If you find the idea of getting rid of things to be daunting, these areas generally contain articles that are rarely if ever used: discarded clothing, extra sets of dishes, holiday decorations, old blankets, schoolwork and furniture that has been replaced in the front rooms. It all seems to wind up in these rooms. This is a good place to begin, as decisions will be easier to make. Whatever you do, don’t fall victim to zigzagging. That’s when you start in one area, go into another room to get something, become distracted by a project that requires attention, and open a second front of de-cluttering. This is a success- prevention strategy of the first order. You will feel like nothing gets accomplished and you will create an atmosphere that will dissolve into chaos. No matter where you start, arm yourself with boxes and appropriate containers for sorting. Decide on what you want to take to the new place that can be packed up and labeled until you move. Designate an area for storing it either inside or out of the home. Key categories include Donate, Toss, Sell, Move to Another Room and I Don’t Know. There can be sub-categories for sale to consignment, on-line or garage sale. Many people maintain a strong emotional connection to specific items. Sometimes we feel that we are the custodians of our family’s legacy, embodied in the heirlooms we inherit. People feel guilty if they choose to part with these. It is often easier if you can photograph something, incorporate it in an art project or find somewhere to donate this type of thing where the recipients will appreciate it. If you have a large collection, it is permissible to save a representative portion and allow yourself to donate the excess. Once you have determined what your categories are, it is essential to follow through on the exit strategy. If there is a clothing donation drop on your way to work, take a bag with you as you leave in the morning. When does the recycling truck come to your area? Make sure those bags of mixed paper and shredding are out there every week. Call the charities and find out when they will be in your neighborhood, and plan your de-cluttering around their schedule. Don’t leave bags and boxes parked in your hallway or garage for indefinite periods. Storage facilities have a specific purpose in the downsizing process. You might want to use them temporarily to house excess furniture or artwork while you are staging and showing the home for sale. Storage lockers fall under the heading of postponement tactics. The danger is mostly to your pocketbook. Storage is an ongoing expense. It is better to deal with items of questionable value before making the move. How much of what is crowding your house is actually yours, and how much are you storing for other people? If your children have moved out, have them decide if they want to take all the things they left behind or have them make other arrangements for them. You can’t let other people hold you back from achieving your objectives. If you feel you are not up to the task, why not ask a trusted friend, family member or a professional to assist? Choose someone who is objective and decisive and not involved emotionally with your possessions. Downsizing is a great way to bond with family members because it is an opportunity to honor the past and share the stories. Make it easy. Get it done. Whether you choose to sell, donate or toss, choose a method that causes the least wear and tear on you. This can be an exhaustive activity, performed best in stages and small chunks over a period of time. Use the Internet extensively to find resources for distribution of unusual objects or substances. Garage sales can be effective, but they require a great deal of planning, pricing and a fallback plan for those items that don’t sell. Connect with charities that will pick up your clothing and household goods. Ditto for consignment. Give your friends and family deadlines for taking the stuff you have saved for them. Reward yourself with a new purchase that you have been postponing because you did not have enough room. Once you have run the gauntlet, the rewards of de-cluttering are manifold. It saves your money, as there is less to move. It saves you time. Everything you own requires time and attention. Less stuff translates to more time for you. It also reduces the stress associated with a major change. 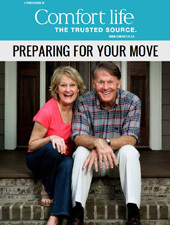 And, finally, when you are ready to downsize to a retirement community, townhouse or condo, settling in will be easier.